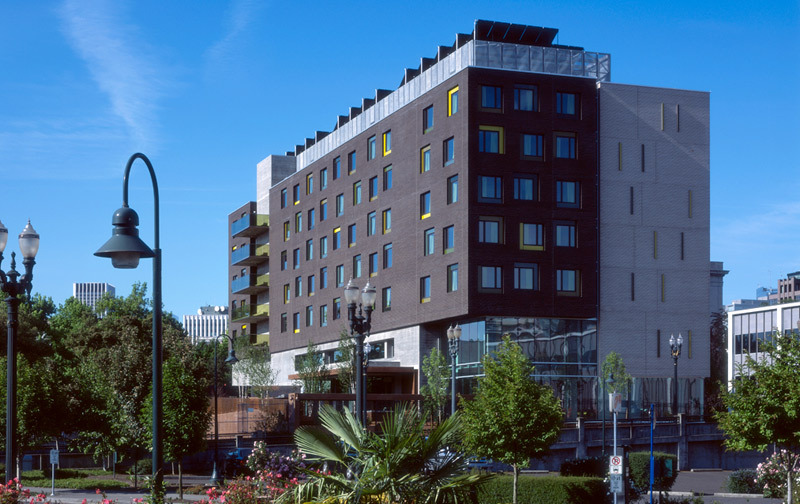 A cornerstone of the Portland region’s ten-year plan to end homelessness, the Bud Clark Commons is the result of a joint collaboration by the Portland Housing Bureau, Multnomah County, Transition Projects, and Home Forward. 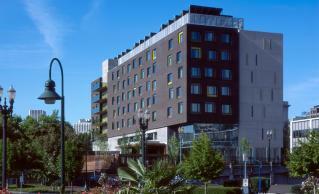 Bud Clark Commons is certified as the first LEED Platinum project of its kind: permanent supportive housing apartments, a transitional shelter, and a daytime resource center all in one central Portland location. Home Forward developed, owns, and manages the Commons, which opened in June 2011. The Apartments at Bud Clark Commons provide studios for the most vulnerable homeless individuals as screened by four medical clinics using a vulnerability index tool. An on-site operations team and partner organizations assist residents with case management; medical, mental health, substance abuse treatment; vocational, employment, and money management services; life skills training; and advocacy. Doreen’s Place, managed by TPI, coordinates volunteer-based cooking for one meal each day; case managers, counselors and advocates work with 90 residents to achieve permanent housing (average stay is approximately two months). The facility is certified LEED Platinum and includes numerous sustainability features including solar hot water pre-heat panels, heat recovery ventilators, and greywater recycling. Community organizations – The program handout for the grand opening event on June 2, 2011 provides a summary of the many community partners.